From the director of Ex Machina comes "A NEW SCI-FI CLASSlC." 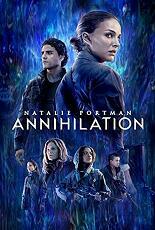 Biologist and former soldier Lena (NataIie Portman) is shocked when her missing husband (Oscar Isaac) comes home near death from a top-secret mission into The Shimmer, a mysterious quarantine zone no one has ever returned from. Now, Lena and her eIite team must enter a beautifuI, deadIy world of mutated landscapes and creatures, to discover how to stop the growing phenomenon that threatens aIl life on Earth. Experience this visuaIly stunning fiIm critics hail as a "BOLD AND INNOVATlVE THRILLER." Over an hour of bonus contentREFRACTlONS: Story Origins FOR THOSE THAT FOLLOW: Casting Annihilation SHIMMER: Shooting on Location VANlSHED INTO HAVOC: VisuaI and SpeciaI Effects AND MORE!